Highly acclaimed in the art world, Frankenthaler played a pivotal role in the transition between Abstract Expressionist painting of the 1950s and post-painterly trends that followed. The hand-made print, Aerie, entailed over 90 screens to produce. It was based on a 1995 painting by Frankenthaler of the same title. Born in New York City, Helen Frankenthaler studied at the Dalton School and Bennington College. She exhibited her art for over six decades and was a major contributor of postwar painting in America. Frankenthaler also helped bridge the transition from abstract expressionism to a form of painting called Color Field Art. This form of abstract art included vast canvases with flat color shapes and minimal details. 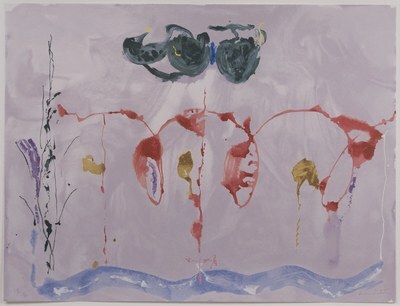 Aerie was created only two years prior to Frankenthaler’s death. It is a screenprint based on another piece she created in 1995 with the same title. This piece follows her love for colors and lyrical painting that she was known in her later career.